1. 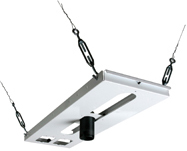 CMJ500 mounts above existing 2' x 2' or 2' x 4' ceiling tile to structural ceiling with tie wires. 2. CMJ500 allows 13.9" uninterrupted adjustment. 3. Includes tie wire supports, flush mount tube and offers two knockout panels for outlet boxes. 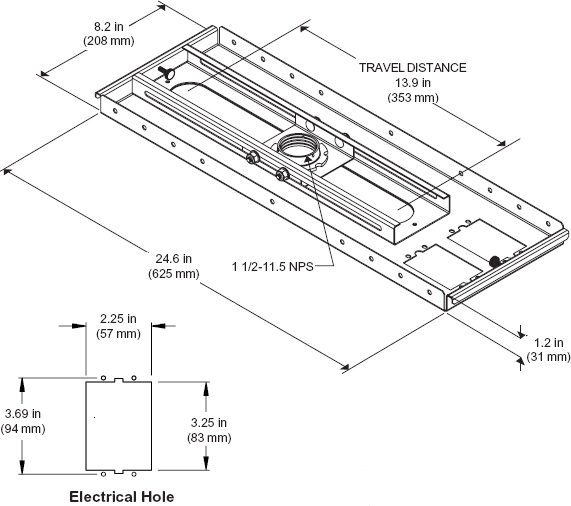 The Lightweight Suspended Ceiling Plate for Projector Mounts consists of an 8"(203mm) x 24"(610mm) filler tray and a 15.75"(400mm) x 24"(610mm) ceiling tray suspended by four tie wires from the true ceiling above. (CMJ455 does not include hanger brackets).